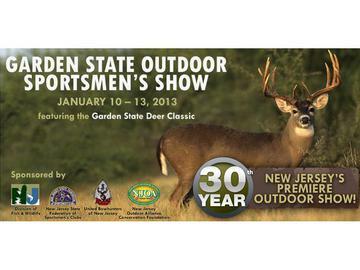 The 30th annual Garden State Outdoor Sports Show is taking place January 10-13, 2013 at the New Jersey Convention & Exposition Center in Edison, NJ. As one of the greatest sport shows on the east coast, our goal is to deliver top seminars, attractions, and exhibits designed to speak to sportsmen and women of all ages with a focus on activities the whole family can enjoy. The event is presented in partnership with The New Jersey Department of Fish and Wildlife, The New Jersey Outdoor Alliance, United Bowhunters of New Jersey and The New Jersey State Federation of Sportsmen’s Clubs. *Note: One subscription per household. First subscription issue will be received within 8-10 weeks of the show. * A show postcard with refund information will follow. Should you wish to participate in this offer, please select the ticket above that reads "Adult One Day Ticket + 1 year subscription to (magazine of choice)." *Please note: Each One Day Admission Ticket can be redeemed on ANY day of your choice.